It’s Friday! That means par-tay! Last week, y’all really brought your “A” game. There were so many fantastic projects, and sadly, I ran out of time and didn’t get to feature all of them that I wanted to. If you missed the ones I featured, you can see them in the Inspiration Files Gallery. But let’s get on to this week’s party, shall we? I’m excited to have just found your blog and party…it looks like such a great place to hang out! Thanks so much for hosting, I love your feature choices! Thanks for hosting! Lots of great projects already linked up! Glad to be here partying with you this week Kristi! Thank you so much for hosting, hope you have a lovely weekend! I made it to the party! Thanks for hosting! Have a great weekend! 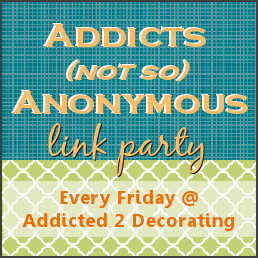 I always love the jewels you share from your linky party!! And I *love* my new snowball wreath. I’m going to carefully pack her away until next winter when she’ll be stunningly perfect! Thank you sooooo much!!! !